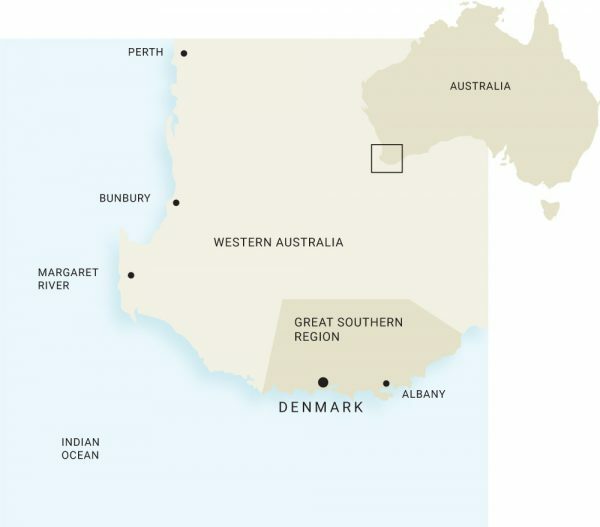 The Great Southern in Western Australia is the largest wine region in Australia by area and is the second largest producer of grapes in Western Australia. It is a landscape of forested cliffs and stunning mountain ranges, breathtaking coastlines, rolling green pastures and towns steeped in history. It is made up of five subregions: Albany, Denmark, Frankland River, Mount Barker and Porongurup. The first vines were planted in the mid 1960’s when a trial vineyard was established near Mount Barker. The original vines were Riesling and Cabernet Sauvignon. Today, the Great Southern is well and truly in the spotlight on a national and international stage. There are now about 70 wineries in the area with main varieties consisting of Riesling, Chardonnay, Sauvignon Blanc, Semillon, Pinot Noir, Merlot, Shiraz and Cabernet Sauvignon. While most wine regions have their star varieties, due to the sheer size of Great Southern and its varied terrain, it has the capacity to produce world-class wines from a range of classic varieties.